Glitter nails may seem like something only children should do. But I beg to differ. There are certainly was in which to make glitter age appropriate. The first would be to choose a smaller sized glitter polish. One that is fine and less chunky. If your not as daring try this style as I have by placing it on one finger. I chose to place it on my pinky finger. 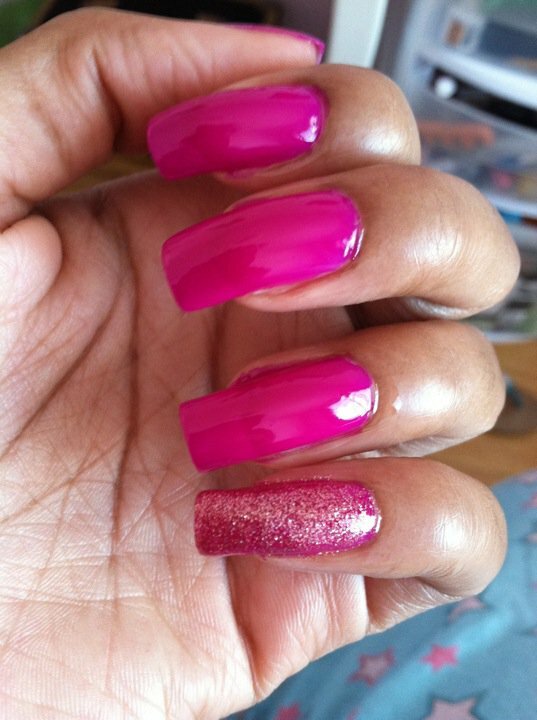 Also choose a glitter that matches the shade of polish that you have on your other nails. The glitter polish I am wearing is from butter London 3 free nail lacquer in the shade called Rosy Lee paired with a pinkish purple vibrate polish. But if your daring go all out and apply to all nails and enjoy!